Billings, an old railroad town in Montana with humble beginnings, is a unique destination offering a big city appeal as well as access to open spaces and beautiful landscapes. History is a key drawcard to this city. Visitors to the Pictograph Cave State Park can venture to the prehistoric era with its cave paintings over 2,000 years old, still in their original state. 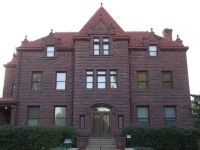 The Western Heritage Center in downtown Billings, home to over 16,000 historical artefacts from the Yellowstone River Valley, is a popular choice with history buffs, as is the Moss Mansion Historic House. Placed on the National Register of Historic Places, the 1903-built Moss Mansion has been preserved to capture family life as it was way back when in the state of Montana and draws in many visitors each year. For those with a penchant for the arts, the Yellowstone Art Museum is a most memorable stop with exhibits of both contemporary and historic art from the Rocky Mountain West. Billings is also home to a Performing Arts Center as well as several theatres and a symphony orchestra. Visitors in search of some open space and natural beauty need only take a short drive to the Chico Hot Springs set in the aptly-named Paradise Valley. Chico Hot Springs is home to two open-air mineral pools as well as many outdoors activities such as horseback riding, hiking, white-water rafting, fly fishing, and more. A drive to Missoula will prove a unique excursion filled as it is with hippies and students. With a history of providing visitors with much to explore, as well as some incredible outdoor activities, Billings makes for a memorable visit.